Chris Hartlage, Braden Hurst, Lee Janasek, Michael Porter and Jordan Thomas from the Bellarmine University Physical Therapy Program's Pathophysiology of Complex Patient Problems Project. Demographics: Patient is a 33 year old Caucasian female who is a middle school teacher. Subjective: Tracey Smith reports to Function First, via direct access, for general muscle weakness and low back pain. She has been having low back pain for a little over 4 months now. On a scale of 1-10, her pain at best is a 3 and at worst is a 7. The general muscle weakness has been getting progressively worse over the past month and is beginning to concern her. Mrs. Smith also reports having trouble making it through her water aerobics class on Tuesday’s and Thursday’s. She says lately she has little interest in her regular activities and has been experiencing fatigue without physical exertion. Patient was diagnosed with type II Diabetes in her late 20’s and has been taking insulin regularly since her diagnosis. Mrs. Smith has also been experiencing headaches more frequently at night over the past few weeks. She was treated at Function First in 2013 for hip pain secondary to bursitis. After 4 weeks of conservative treatment, Mrs. Smith’s pain was still present and she was referred to her back to her primary care physician where he administered multiple corticosteroid injections. Patient also reports she has been taking inhaled corticosteroids for the past 7 years. Lastly, Mrs. Smith reports having irregular menstrual cycles for the past 2 years accompanied by unexplained weight gain in her abdomen. Goals: Patient would like to have little to no back pain. Patient also would like to be able to increase her strength and endurance in able to resume her normal Zumba classes twice a week. Pt presents with purple/pink stretch marks on arms, abdomen, and thighs. Pt has multiple cuts and bruises on her arms and hands with an explanation of having thin skin. Pt is obese with noticeable fatty deposits in the upper back and midsection. Based on the information gathered from the subjective and objective history, the primary hypothesis would be that this patient is suffering from Cushing’s syndrome. The patient complained of unusual fatigue, back pain, headaches, irregular menstrual cycles, generalized weakness, and a recent lack of interest in her normal hobbies/activities. 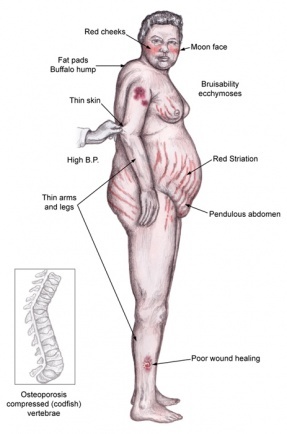 Accompanied by objective findings of proximal weakness, purple/pink stretch marks, multiple bruises, and noticeable fatty deposits, Cushing’s syndrome would be the most probable diagnosis. We believe this patient would need to be referred to a medical doctor to confirm the presence of Cushing's syndrome and for other treatment outside the scope of physical therapy. This being said, this patient would be a great candidate for physical therapy and would benefit from a muscular strengthening and endurance program. Patient displays proximal muscle weakness, obesity, low back pain, signs of fatigue, and generalized decrease in thoracic and lumbar ROM. Aerobic exercise will be implemented to address weight loss and muscular endurance. A strengthening program will also be implemented to address the proximal muscle weakness, low back pain and fatigue. Manual therapy will also be added to increase mobility of the lumbar spine and decrease the pain she is experiencing. Mrs. Smith will benefit from continued skilled physical therapy, three times a week for eight weeks, to address functional limitations such as weakness, aerobic endurance, and ability to participate in her exercise classes. It has also been shown that those diagnosed with Cushing’s syndrome may also suffer from Glucocorticoid-Induced Muscle Atrophy. Signs of this muscle atrophy can be seen in the proximal muscle weakness associated with Cushing’s. Physical therapy interventions to address this issue should contain resistance and endurance training. Resistance training should include activities that support bone and muscle mass growth since osteoporosis is also an additional disease these patients can face. Exercise dosage should be focused on increasing muscular strength and hypertrophy to help fight off the affects of muscle atrophy. Some examples of resistance training exercises are wall push-ups with a serratus press, wall squats, single leg stance, quadruped alternating upper/lower extremity extension, bridging with a posterior pelvic tilt, and scapular retraction with a theraband. Endurance exercises should also be incorporated to address the deconditioning affects of muscle atrophy. Endurance exercises can also be geared towards community activities such as walking in a park, cycling, swimming or water aerobics, and also running if it does not increase pain. Exercise prescription can be progressed when there is an increase in strength noted by the treating therapist and the ability of the patient to tolerate an increase in exercise without adverse reactions. In addition to physical therapy, patient was referred to MD for further diagnostic testing to confirm Cushing’s syndrome. After confirmation Cushing’s syndrome, her primary care physician prescribed mifepristone to block the effects of cortisol on tissues. Her MD also reduced the dose of her corticosteroids being used to treat her asthma. Due to Mrs. Smiths high motivation to get back to her usual activities and get healthy, her prognosis is very good. She responded well to her first treatment session, but did report increased muscular fatigue during wall squats and while riding the recumbent bicycle for ten minutes. Patient needed both verbal and tactile cueing when performing scapular stability exercises and wall squats. After four weeks of conservative therapy and pharmacological treatment, proximal muscle strength and aerobic capacity/endurance had both increased substantially. Over the remainder of her treatment sessions, she was able to increase her strength and endurance enough so that she was able to partake in her weekly water aerobics classes and could also go on much longer walks around her neighborhood without having an excessive feeling of over exertion with minimal activity. Her back pain had also decreased to a 0/10 at best and 2/10 at worst. Since starting her treatment and exercise prescription, she had notice a decrease in her weight and she no longer felt depressed about going to and participating in her zumba class. In the literature, there are multiple case studies that suggest proximal muscle weakness as a primary cause of the physical deconditioning. Cushing’s could be a potentially huge factor in treatment because of how many patients are prescribed corticosteroid medication for pain and inflammation. Patient education should be incorporated into the treatment plan about the use of multiple types of corticosteroids in patients with multiple co-morbidities. A physical therapist should be up to date on their knowledge of Cushing’s syndrome because of the adverse diseases or conditions which can then affect the patient. Joint and bone protection should be a primary concern of the therapist due to the increased weight gain, osteoporosis, and muscle atrophy associated with Cushing’s Syndrome. ↑ 1.00 1.01 1.02 1.03 1.04 1.05 1.06 1.07 1.08 1.09 1.10 1.11 Cushing’s Syndrome: Mayo Clinic Diseases and Conditions. http://www.mayoclinic.org/diseases-conditions/cushing-syndrome/basics/definition/con-20032115. Published 2013. Accessed March 21, 2015. ↑ 2.0 2.1 2.2 2.3 2.4 2.5 2.6 2.7 2.8 Cushing’s Syndrome: MedLine Plus. http://www.nlm.nih.gov/medlineplus/cushingssyndrome.html. Updated September 25, 2014. Accessed March 21, 2015. ↑ 3.0 3.1 3.2 3.3 3.4 3.5 Goodman CC, Snyder KS. Differential Diagnosis for Physical Therapists: Screening for Referral. Philadelphia : W.B. Saunders Company; 2013:415-416. ↑ Castinetti F, Morange I, Brue T. Cushing’s Disease. Orphanet J of Rare Diseases. 2012; 1-9. ↑ 5.0 5.1 5.2 5.3 Ensor, W. Endocrine and Metabolic Disorders. [PowerPoint]. Louisville, KY: Bellarmine University DPT Program; 2015. ↑ Causes & Differences Between Cushing’s Disease and Cushing’s Syndrome: About Cushing’s. http://www.aboutcushings.com/understanding-cushings-disease/causes-and-differences.jsp. Updated 2015. Accessed March 26, 2015. ↑ Cushing Syndrome: Medscape. http://emedicine.medscape.com/article/117365-overview. Updated April 14, 2014. Accessed March 26, 2015. ↑ The Biochemical Investigation of Cushing Syndrome: Medscape. http://www.medscape.com/viewarticle/474901_2. Published 2004. Accessed March 25, 2015. ↑ 9.0 9.1 9.2 LaPier T. Glucocorticoid-Induced Muscle Atrophy: The Role of Exercise in Treatment and Prevention. J Cardio Rehab. 1997; 17: 76-84.